I realize the title says fashion, however these shoes are more for practicality reasons than looking fabulous. I'm looking out of my window and there is three feet of fresh snow, and my phone is telling my that there is a high of three degrees. Three. Do you understand where I am coming from? These are not only my top picks, they are shoes that I indeed own and truly am wearing all winter long. Yellow Hunter Boots. These are the tall, gloss, original Wellies. What a mouth full! They are not only adorable, they are quite honestly the best pair of wellies that I have ever owned in my life. At a steeper price than most, that is what to expect, however they do offer great sales from time to time. These are an investment that will last years. Just keep telling yourself that. LL Bean Bean Boots. These are certainly not for everyone, in my opinion they are though. I truck through snow, puddles, mud and sand with my bean boots on and am yet to experience anything wrong with them. Comfortable, durable and crazy practical. I have convinced my mom to buy a pair and two of my sisters had them on their Christmas lists. 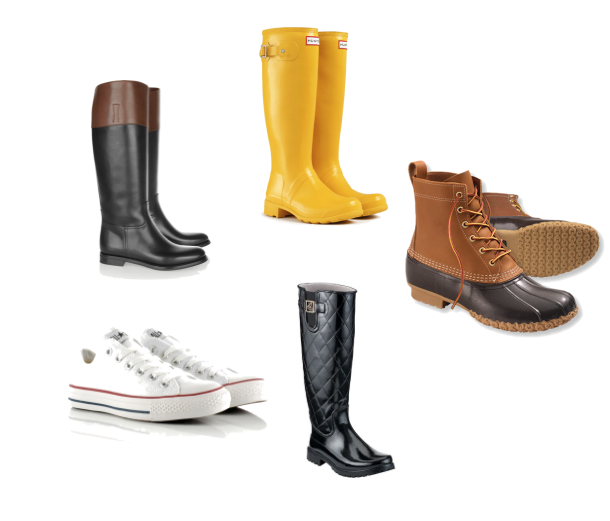 Sperry Top Sider Wellies. Yes, I know. Another pair of wellies. In my opinion you can never have enough. Am I right? Chuck Taylor Converse. For those days when my ankles want to feel a little bit of fresh air, I toss on my white Chuck's and call it a day. This classic shoe isn't crazy popular for no reason, they are comfortable and classic. Etienne Aigner Riding Boots. These are the boots that I can easily dress up and wear with a skirt or some black leggings. Decent in the snow, and definitely needing some weatherproofing, these are about the style and not the practicality. Really though, aren't they adorable? What is the weather like where you live? Is it forcing you to wear only boots, like it is me?